Theron wrote: There's a good amount of shots of Unit 13 on Yamaguchi's twitter- he likes to post pictures of about-to-be-released revoltechs in shenanigans. whew unit 08 is even more bubblegum pink in figure form. There's some boxed pics of unit 08 over on Hobby Search, looks pretty good. Impressed that Kaiyodo have seen fit to not only include unit 02's robot arm but also another right shoulder pylon with the tiny screw detail present on these 3.0 eva variants, that's attention to detail! But 2 of which one? The normal or the light-able one? Hmmm I wonder who that was? (T.T) and it was 2 left pylons. Which reminds me, SEELE-01, I'm quite interested to see what customs you have done. I know of your several (and ungodly expensive) custom Eva 04's, have you any others? I'll post pics of mine as soon as I've finished (sculpting, casting molds, and resin is quite the slow, costly process). Wait, I do have a finished re-paint of 02 if you'd like to see it. Currently I'm sculpting a modified head for it but it still looks fine with the 02 head. What about the MP Evangelion? You know, the one with the mangled Unit 02 base, and the multiple gory stumps you can plug into its arms. I saw one at a convention table and was very tempted to pick it up-should I have? Isn't recasting parts of a design you don't own slightly...illegal? Do you have this one dustwulf? I had that whole Chogokin set til I sold it on ebay awhile back. They are alittle shorter then the EvaEvos.The rifles are a little bigger because the figures themselves are "Wider". But not by much, most the weapons from those sets will work with EvaEvos but RDs hands are to small and flimsy. Have 2 of the Unit 02 and 2 MP Evas without wings and one MP Eva with wings. I love these figures. They can get lots of great poses. The only downside (just what i've had happen on nearly all of mine) is that the ankles break incredibly easy. Don't know if its a weak joint or what. Otherwise these figs are way better then the Kaiyodoo Xebec line. Squigsquasher wrote: Isn't recasting parts of a design you don't own slightly...illegal? Resin casting is expensive to say the least so If I wanted to have multiples of the same figure it'd just be cheaper to purchase multiple. In effect I am not harming the company or its profits. 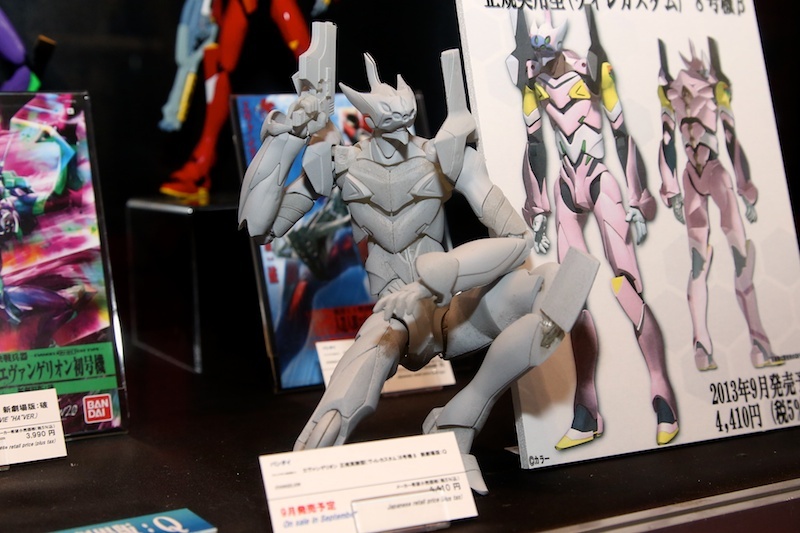 Wait how are the pylons attached in the new Eva figs? If I remember they were originally simply a peg. In Evo series theyre a tiny revo joint into the shoulder, which isnt very good either. They come out very easily. Archaiel wrote: Hmmm I wonder who that was? (T.T) and it was 2 left pylons. 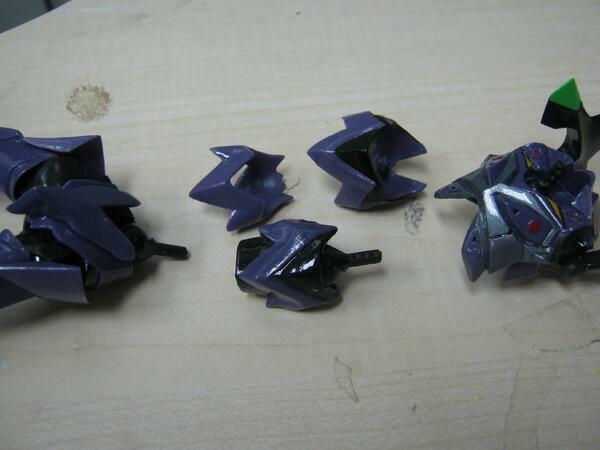 Archaiel wrote: Which reminds me, SEELE-01, I'm quite interested to see what customs you have done. I know of your several (and ungodly expensive) custom Eva 04's, have you any others? Archaiel wrote: I'll post pics of mine as soon as I've finished (sculpting, casting molds, and resin is quite the slow, costly process).Wait, I do have a finished re-paint of 02 if you'd like to see it. Currently I'm sculpting a modified head for it but it still looks fine with the 02 head. Nice! I'd like to see that! 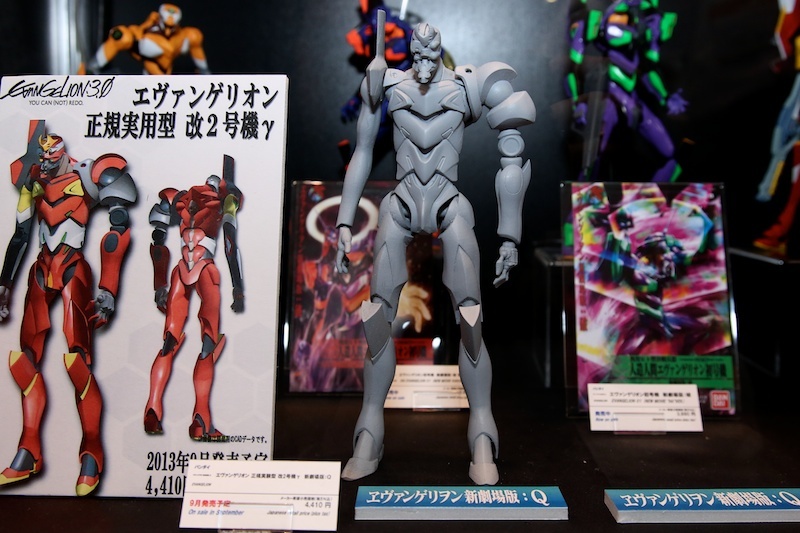 gruntyguy wrote: Wait how are the pylons attached in the new Eva figs? If I remember they were originally simply a peg. In Evo series theyre a tiny revo joint into the shoulder, which isnt very good either. They come out very easily. 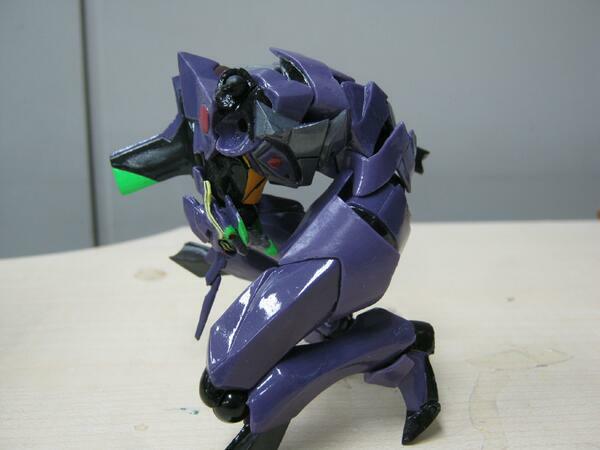 fleeting wrote: Have 2 of the Unit 02 and 2 MP Evas without wings and one MP Eva with wings. I love these figures. They can get lots of great poses. The only downside (just what i've had happen on nearly all of mine) is that the ankles break incredibly easy. Don't know if its a weak joint or what. Otherwise these figs are way better then the Kaiyodoo Xebec line. Ah, right. Different line, I see. They do look great, arguably better than the Revoltechs (fragility aside). Did Kaiyodo make any other Evas under the same line as the MP Evas? Nope. 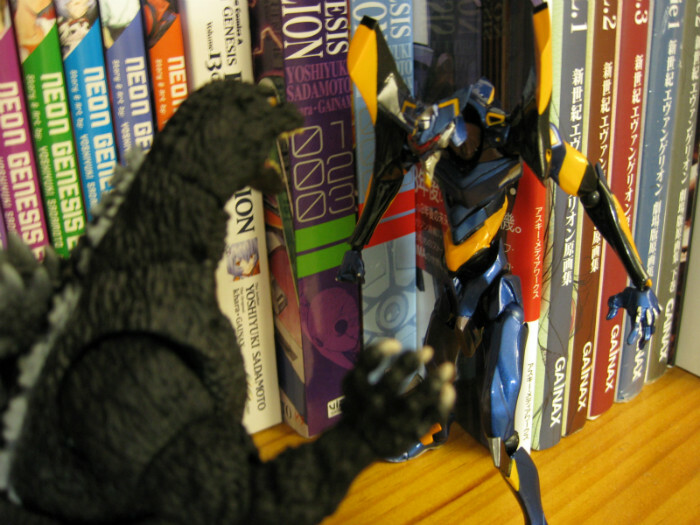 Only 3 were made for the release of End of Evangelion. 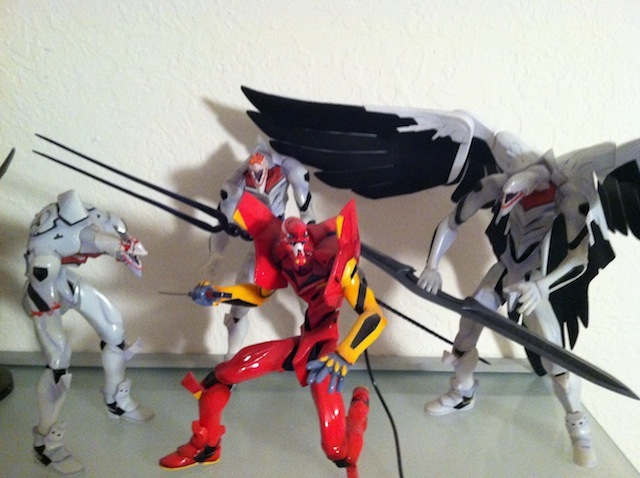 Unit 02 and the winged and non winged MP Evas. The Xebec line made 00,01,02,03 and 04. Most have a metallic repaint too. Unit 01 has a deluxe edition that has most of the weapons the other Evas come with also. The colours and paint are really well done. I'm not a fan of the glossy finish, which I think looks a little odd on figures like the Test Type, but it works wonders on the Mark.06 here. QC-wise, there's a strange mold gloop on the right-side of the waist which kind of effects the poseability somewhat, but nothing I can't live with. Might have to look into doing something about it if it becomes more of an issue down the line, so lucky I got you guys to go to for advice then, hey? Hehe. 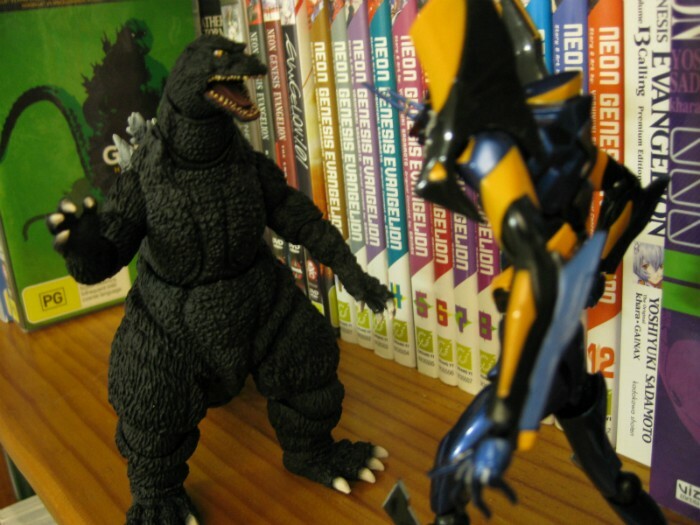 [Also pictured; SHMA Godzilla 1994]. The different hands are super easy to attach and I probably won't bother using that moon head variant - The only thing I wanted was a taller stand so I could have the Mark.06 displaying in that classic descent imagery, Spear of Cassius in-hand. Should be able to mock a solution together myself though using the bits provided by the release. Hopefully I can get some more time to play with it during the week and see what kind of poses I can get out of it. Next time: Evangelion Mark.06 Revo vs Link (Skyward Sword) Figma!